This is an essay on marriage that can't help YOUR marriage. No article or book or well-meaning advice from a friend can. But the good news is- YOU can. Like most important things in my life I have learned this the hard way. Every article I perused didn't cut it for me. "Five ways to fix your marriage" the title beckoned, but it just doesn't work that way in reality. An article can't put in the hard work and communication and honesty and tears. "You need more date nights" many suggest- so we tried that. We sat there at a restaurant opposite each other like strangers. Besides the children we didn't know what to talk about any more. Our problem wasn't due to a lack of quality time spent together- it was caused by fissures in communication and intimacy. As the years passed we grew further apart. Our upbringing caused us to speak two very different languages and both of us were left feeling unseen and misunderstood. He speaks in facts and to get things done. I speak to emotionally connect. Finally four months ago we made a tough choice to begin marriage counseling. Both of our precious boys have autism and many assume that is was caused the a break-down in our marriage. That is not the case for us- our communication and intimacy problems have been here since the beginning. The truth is, I don't think most marriages disintegrate over one big thing, but instead over many little hurts compiled and swept under a bed day after day. Through hard work, a willingness to try and counseling we are working to connect with the things that made us fall in love and get married in the first place. My husband Michael and waiting to go into counseling. It's the hardest yet most important part of my week. It's taken me a long time to realize that my marriage is a living breathing thing and it needs attention and upkeep. Like children- no two relationships are the same and what works for one may not work for another. Here are a few things that so far have worked for me. "How often do you and Michael fight?" Our counselor asked. "About once a week", I told her. "How often do you get mad at him?" She asked, rephrasing the question. "Oh- probably every day- I replied. I'm a lover- not a fighter. I really HATE fighting- so when I get angry, I stuff it down inside and file it away. Once a week or so- something makes me mad, like really mad which sets me off and a week of his misdemeanors all come flying out at once. "But I'd rather fight once a week instead of every day." I told our counselor. "Why does it have to be a fight in the first place? She asked. Hmmmmpfff. Good point. I am working on expressing my feelings in the moment instead of bottling them up. I am also working on using words more specific than angry/pissed/mad. Anger is usually born from sadness, disappointment, frustration and fear- so we are using those truer labels instead. 2. DO NOT HAVE SERIOUS CONVERSATIONS AFTER 6pm. Just do not. I CAN NOT. After a long day with our 5 and 3 year old my brain is FRIED in the evening. My brain is amazing at watching BRAVO TV then, but it does NOT function on serious life topics after 6pm. I can easily see myself bursting into tears while trying to decide between ketchup and BBQ sauce after 6pm. At night- KEEP IT SIMPLE. A friend told me that her and her husband ask first -"Is this a good time to talk?" Before having any serious discussions- and if the other person says "No"- you aren't allowed to push it. If there are things to be discussed, make sure you do it at a time that works for both of you. Go grab a latte on the weekend, keep an open mind and talk. This is one is tough. I am much better at doing it ALL by myself while getting more and more pissed off at him for just sitting there on his phone. I want him to want to do the dishes!!! If you don't know what quote I am referring to you HAVE to watch this clip. Please! I've never been more serious about anything. (But I want you to WANT to watch it. Don't just do it because I just begged you). You see, many men are just NOT wired this way. Sometimes I feel like I do everything. Why can't HE see that the kids need to be fed or that the floor needs to be vacuumed or the dishwasher needs to be emptied? Why do I have to ASK him to do these things for OUR family? BECAUSE I DO. BECAUSE I DESERVE TO BE HAPPY. It's just part of the gig. I can do them ALL myself and stay pissed - or I can ask for his help. It's also important to note: When he helps- I am NOT ALLOWED to correct him, redo it or tell him that he's doing it wrong (aka- not doing it MY way). If I ask for his help- I've got to accept the help that he offers. 4. MAKE SURE TO TAKE CARE OF YOU. One person can't be your everything. That is too much responsibility for another person and leaves too much empty inside you. You are in charge of you- and here's the thing- you are not a burden. You are a life. You are an adventure. You must have other outlets and friends and hobbies that give you the things that you need to be the person you want to be. You were your own complete person before you met your spouse and it's important that you don't ever let that person slip away. The more robust your life- the happier you are. The happier you are- the better your relationship will be. If your toilet broke you'd go to a plumber. If you were sick- you'd go to a Doctor. 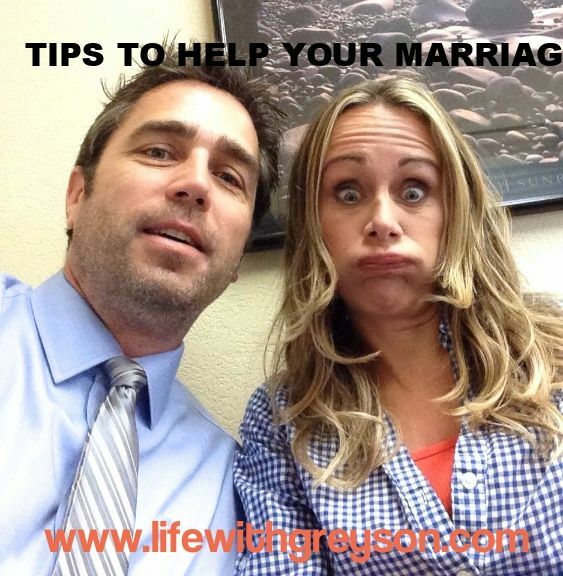 So when your marriage is hurting- go to counseling. We don't know it all and sometimes we can't do it on our own. Don't wait until you're beyond angry and frustrated. You deserve a happy and healthy relationship and chances are you've tried everything you could yet it still isn't better. Going to relationship counseling isn't a declaration that your relationship is doomed- it simply shows that it is worth working on. It isn't something to be ashamed over. Be proud and remember your pledge to have and to hold, from this day forward, for better, for worse, for richer, for poorer, in sickness and health, until death do us part. It is impossible to describe the craziness that can make up our lives (and everything else that comes with the autism diagnosis) and the toll it can take on our marriages. Thank you for choosing to write about the difficult and the real. Good luck to the two of you! You are doing the right thing. Marriage is tough. We waited too long. I'm so proud of you. Michael and you are beautiful souls. I love you! You really are changing the world with your honesty. Thank you for being brave and putting yourself out there and thank you to Michael too for supporting that and being brave with you. Something I read recently that I thought had some really good suggestions (for me) was the "21 Day Relationship Challenge" by Gretchen Rubin, although to be honest I only got to around Day 6 of reading the suggestions. (probably should go back and read the other ones sometime since I thought the first ones were good - huh?) They came via e-mail once a day to my inbox. Remember the whole "flip it" thing? I think there was some of that in there, if I remember right. Anyway, I'm still reading here - just haven't commented lately. I think the most courageous thing is admitting you need help and going to counseling. I'm proud of you. Being married is great and also oh so hard. Everything good takes work and that's ok. We appreciate and enjoy more when we have to work for it. Blessings to you as you do the hard. Thanks for keeping it real, I appreciate that so much. You are brave. I'm not brave yet. I love this. I feel the same way about all of the parenting articles that are linked all over facebook. It seems that each will shame you for the same behavior/parenting technique, that the next is telling you is just fine. I think the only way we can work on ourselves is to look inside and not give into the perception of others or some witty article on facebook. I applaud your bravery in taking the steps to examine and grow your own relationship and asking for help when you realized it was beyond your own measure. Showing up to fight for what matters is the most important thing we can do. What I wanted to say about marriage is one day you both will be in the greatest place with each other having the greatest time with each other and your relationship will feel effortless and you will feel a connection and it will be because you put in the hard work. Hard work has got to come before true success. Like you said today, wait for it, it will come. Keep doing the hard thing and fulfilling results will come. After a devastating hearing loss, there were about 5 years where I didn't feel much for my husband. He had not been there for me. There were other trying events that added to our distress. Of course there was counseling. But time has a way of healing a lot of things. And also with time comes maturing, if we will only stop nursing the wound and let the pain go.